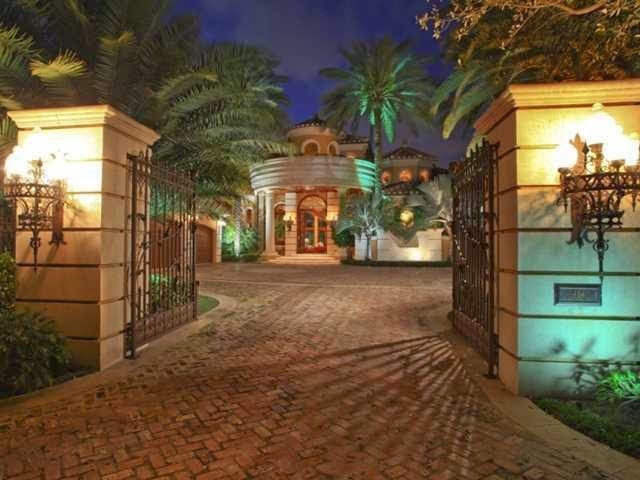 This stunning waterfront Admirals Cove estate is listed in the charming coastal city of Jupiter, Fl. This majestic Venetian inspired estate home features 9,000 square feet with 5 bedrooms, 5 bathrooms, 2 half bathrooms, soaring ceilings, exotic hardwood & limestone flooring, incredible glass walls, a luxurious mother in law garage suite, 4 garage parking spots, a colossal two story living room complete with a hidden media wall, a jaw dropping floating stone & glass staircase, an exquisite theatre room, lavish library, magnificent circular wet bar overlooking the tranquil lanai and resort style swimming pool with a spectacular rock waterfall, a temperature controlled wine cellar, and private dock that can accommodate an 80ft yacht. This amazing estates master suite occupies the entire right wing and includes spacious walk in closets, a luxurious master roman tub and glass shower overlooking a private garden and a marvelous office overlooking the beautiful pool. This home boasts the absolute best in state of the art electronics and appliances and was designed with entertainment in mind. Admirals Cove offers great amenities to its residents like basketball courts, a boating club, an amazing clubhouse and restaurant, spectacular golf courses, a remarkable resort inspired pool, and fabulous tennis courts. This estate is only minutes from an array of decadent dining options, Palm Beach Garden’s trendy downtown area, The Gardens Mall, pristine beaches, and Palm Beach International Airport.